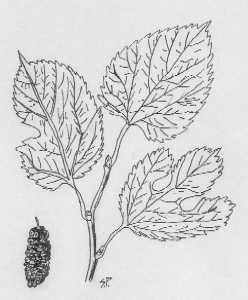 Red Mulberry is a small tree, with simple, alternate leaves. The leaves are 3 to 5 inches long with serrate margins. The leaves make identification easy because the unique leaves almost always have 0 to 3 lobes. The fruit of the red mulberry sort of resembles blackberries. Fruit is cylindrical, 1 to 1 1/4 inches long. Maturing June to August. The fruit of the red mulberry is a favorite of deer, wild turkeys, foxes, and birds. Deer will sometimes eat the leaves.